Henry Richard Fox (later Vassall), 3rd Baron Holland (1773-1840), Whig statesman and patron of art and letters. Sitter associated with 55 portraits. Sir George Hayter (1792-1871), Portrait and history painter; son of Charles Hayter. Artist associated with 198 portraits, Sitter associated with 16 portraits. In this sketch Hayter has focused his attention on catching the head and upper body, completing the legs and backgound quite simply. George III dies at Windsor Castle on 29 January and George IV ascends to the throne. 'Trial of Queen Caroline' in the House of Lords; Parliament drops the Bill which was to legitimise a divorce between Caroline and George IV. Cato Street Conspiracy to assassinate the cabinet discovered. Arthur Thistlewood and fellow conspirators are hung. 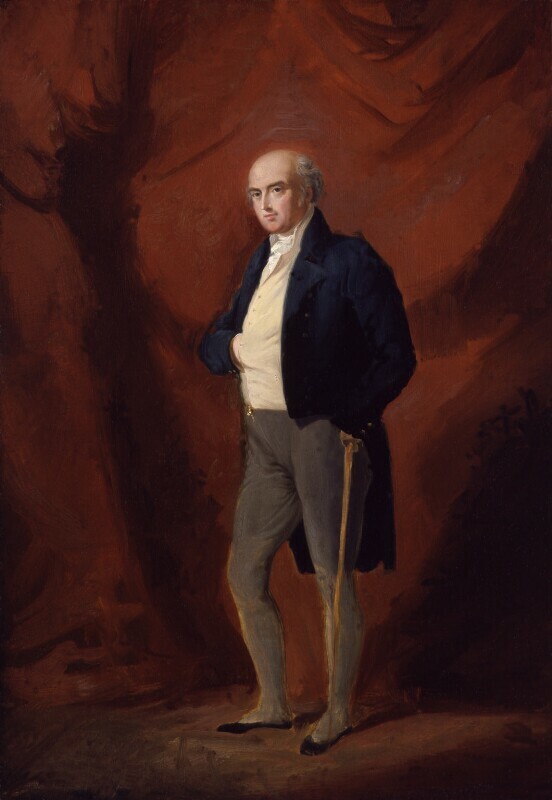 Sir Thomas Lawrence becomes President of the Royal Academy. Astronomical Society is set up by John Herschel and Charles Babbage. First iron steamship is launched. Actor, Edmund Kean goes on a successful tour of America after making his name at the Drury Lane Theatre. Revolutions begin in Spain, Portugal and Naples. The famous ancient Greek statue of the Venus de Milo is rediscovered on the Island of Melos and purchased by the Louvre in Paris.